Slipping and falling or being involved in an accident on public property or other premises is not only dangerous and maybe a little embarrassing, but it can also mean you have a personal injury case on your hands. If you have been involved in a slip and fall accident where you were harmed or injured in some way, then read on or watch our quick video below to learn about the steps you should take after this type of accident. First, you should notify a manager, supervisor, property owner or whoever runs the establishment and report the accident. Be sure to tell the individual where you fell, what caused you to fall, and point out your injuries. Then, you should ask the manager or supervisor to file an incident report that not only documents the accident but also your injuries. Ask for a copy of this report. Take photographs of the scene of the accident, if possible. Speak with any witnesses who saw the accident, or tried to help you in any way—again, if possible. Finally, if you have any type of injuries at all—regardless of how minor they may seem—seek immediate medical attention. By following these steps you are not only ensuring that you are taking care of yourself after an accident, but you are also protecting your rights should you decide to file a personal injury claim. If you determine that your injuries, medical bills, and expenses are substantial, then you should definitely speak with a slip and fall personal injury lawyer. A personal injury lawyer who is experienced in representing individuals who have been harmed in accidents such as these can advise you on how to pursue your personal injury claim as well as represent you in filing your claim, and see your case through to litigation, if necessary. 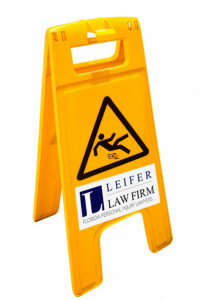 To learn more about how a slip and fall personal injury lawyer can help you, call Leifer Law at 561-440-8531 today.